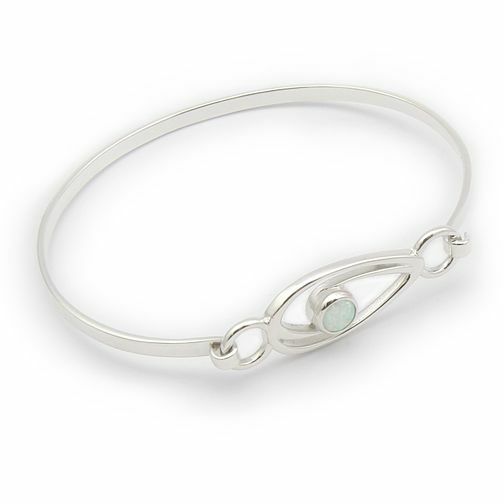 An undeniably feminine piece, this elegant silver swirl bangle is set with a shimmering white opal stone for a fresh feel. Why not team with a matching pendant or earrings? Accessorise your look with unique and traditionally crafted Scottish jewellery from the Orkney Islands by Ortak. Ortak Silver and White Opal Swirl Bangle is rated 4.3 out of 5 by 3. Rated 4 out of 5 by Anonymous from Classic looking bangle A lovely colour opal stone , a pretty bangle . Bought this with birthday money that was given to me. I love it and will consider buying the pendant to match . Rated 4 out of 5 by Anonymous from easy online shopping Quality jewellery with simple elegance. I am not an author so while the statement made may be too short for your software it is succinct and too the point.